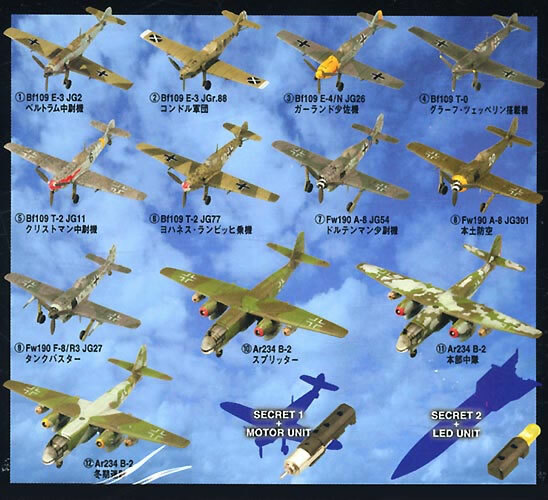 A series of high quality 1/144 true to scale aircraft from Takara. Subjects are World War II famous aircraft of the Luftwaffe and rocket weapons. They are extremely detailed and finished to a very high standard. Two special or secret items comes with working LED and motor units. Motor units can be used to motorised all propeller planes including Do335..
Base contain 2 x hearing aid-type batteries. Comes with one V2 rocket and one LED unit only. Two needed for twin-engined Me262A-1a. Base contain 2 x hearing aid-type batteries. 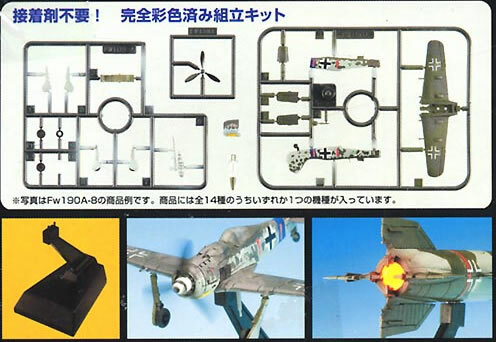 Fits both Bf109 F and Fw190 D-9 Includes adaptor for twin-engined Do335. Comes with one FW190 and one micro-motor unit only. 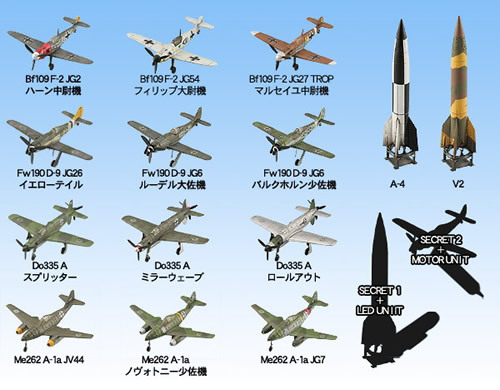 A series of high quality 1/144 true to scale aircraft from Takara. Subjects are World War II famous aircraft of the Luftwaffe. They are extremely detailed and pre-painted to a very high standard but unlike series 1, this series does require assembly. Two special or secret items comes with working LED and miniature motor units. Motor units can be used to motorised all propeller planes. Comprising items 01 to 12 at discount. Model as shown. One left only! Model as shown. Two left only! Me Bf109. Base contain 2 x hearing aid-type batteries. Fits both Bf109s and Fw190s. Comes with one micro-motor unit only. Two required for twin-engined piston aircraft. V2 Rocket. Base contain 2 x hearing aid-type batteries. Comes with one LED unit only. Two needed for twin-engined jet aircraft such as Ar234 or Me262.